RapidCalc is proudly supported by GlucoMen in UK and Ireland. 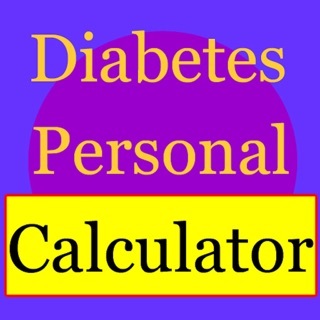 RapidCalc is a sophisticated bolus insulin dose calculator for diabetics following a basal-bolus regimen. With intelligent tracking of insulin on board, automatic carbohydrate ratio and blood glucose target selection, RapidCalc dramatically simplifies blood glucose management. Complete with detailed history, charting and statistics features, RapidCalc is designed to be easy to use and easy to live with. Can't remember when or how much you last dosed? - Don't worry. 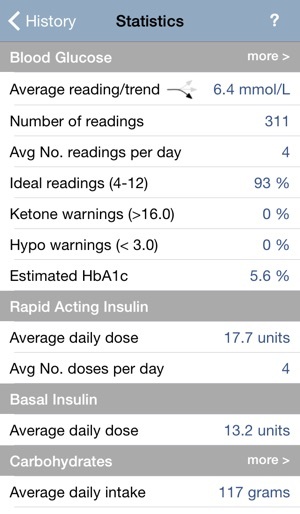 RapidCalc avoids dose stacking by keeping track of your bolus doses and factoring in Insulin On Board when calculating a suggested dose. 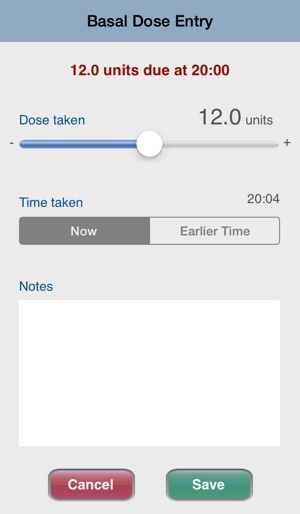 RapidCalc also makes it easy to record your background insulin doses and supports up to three preset doses with optional reminders. RapidCalc delivers many of the benefits normally associated with an insulin pump and indeed users describe it as being like "pumping without a pump". With RapidCalc it is possible to achieve control similar to that of a well set up pump. 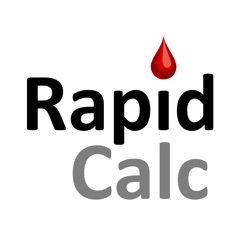 RapidCalc effectively replaces your log book, providing a full 90-day history of blood glucose readings, insulin doses and carbohydrate intake which can be exported via email for archive or analysis. 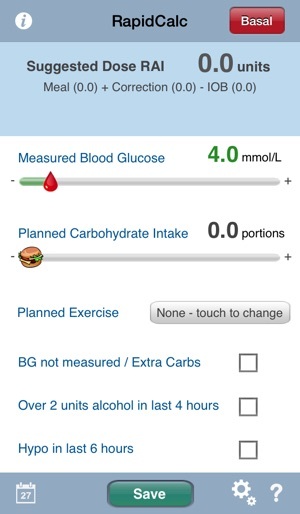 Built-in charts and summary statistics help you assess your blood glucose control, identify trends and even estimate your HbA1c. Still Love this app. Use every time I dose or eat, before/afterany Event. It is almost PERFECT. I tried the pump but gave up after so many failures and disconnections. Returning to RapidCalc, I now use it with a newfound appreciation. Wish I could sync Readings Via Blutooth? I tried to Reimport data into new IPhone but could not figure this out..? Still using everyday, almost everytime I test, it still great. If I use it every time I shoot up and or eat, it becomes a perfect app. When I get lazy then it looses it's usefulness. Using this App I have way better control! Helps to remind me what I ate/shot hours earlier and to consider All the various factors that affect your blood sugar's ups and downs. Good interface. Completely customizable to your body's situation. I wish it had more graphs and that that I could send data in a simpler way. Really good. Type 1, 24 years, Novalog, Lantis, syringes. I've been using RapidCalc for almost two years and without exaggeration it is the best thing I've ever done for managing my Type 1 diabetes. I was able to adjust my numbers to create a program specifically for me that changes based on my sensitivities throughout the day. 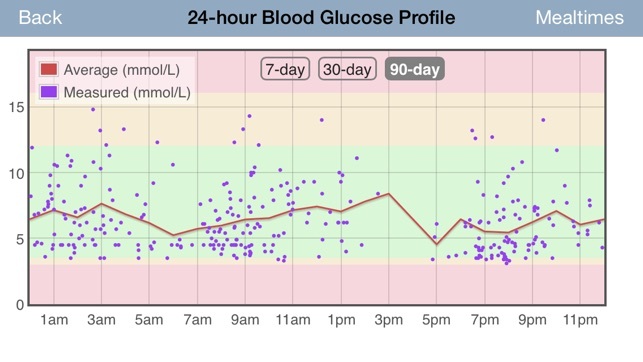 I made small tweaks until I started seeing the blood sugars I wanted. I was able to do this over a couple of weeks, instead of waiting months between doctors appointments. This app has objectively increased my likeliness of staying healthy for a long time. I started using the iHealth Align (a tiny glucometer that you plug into your phone) for blood sugar metering, MyFitnessPal to record carbs of my meals, and RapidCalc to calculate those two numbers into insulin dosages. No more poorly designed PDMs, I do everything on my phone. Two years running and I love this setup. 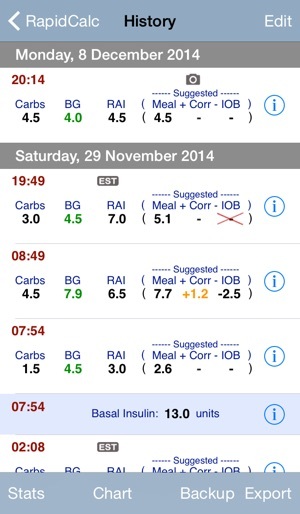 Ian's app has taken so much anxiety out of managing blood sugar levels. 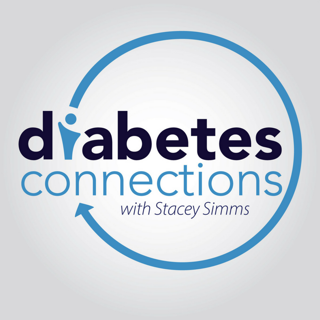 I’ve been using this app about two years and it’s been led to a sea change in my diabetes control. Thank you! I wonder, though, if you have any plans to make it compatible with the Apple Health app. It would be great to capture my insulin dosing in the Health App looking ahead to aggregating all my dia-information in one place for comparisons, etc. Thank you for your comments. 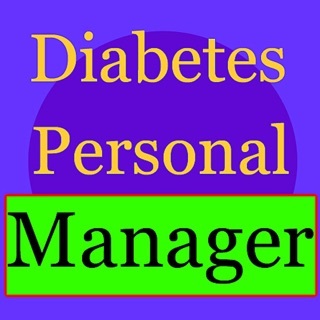 We are very pleased to be able to help you with your diabetes control. We are working on / testing a Apple Health kit link together with other updates but are not in a position to release it yet and cannot say for certain when this will be, at this stage.